Well Freaky Darlings, another year down and gone. But with that we have a whole new year of nonsense to look forward to and enjoy. Some people even think the world will end this year. I suppose it could…the world could be chipping away underneath our feet as we speak. A super weird mutated virus could turn everyone you know and love into flesh eating zombies. Or the world could just keep on spinning (Much more likely) and prove all of the doomsday theorists to be a bunch of whack jobs incapable of enjoying life! 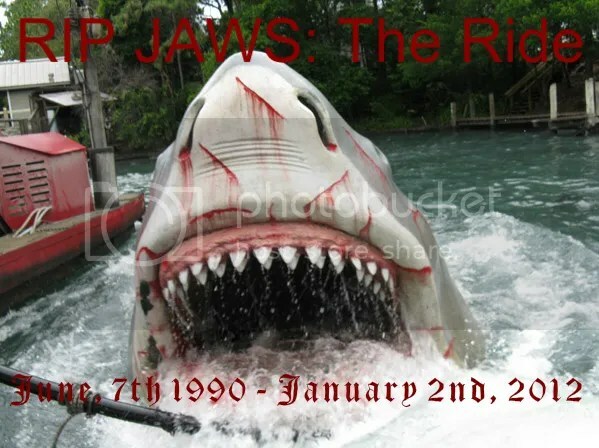 What ever happens, there is something definitely ending that has garnered my attention more, and that is the JAWS: The Ride attraction at Universal Studio’s Orlando. I did promise you all I would post a final farewell as well as my theories as to what is going in (Better post em’ now, because they may post whats going in tomorrow!) So let’s dive into some shark infested waters for the last time shall we! Tomorrow will be the last day of operation for one of the last surviving original rides at Universal Studios Orlando. Riding it one last time was a bit bitter-sweet. I had the pleasure of making that last ride with Seras, Jazmin, and my best friend Todd. As we were going through the familiar twists and turns of the ride, I looked around and remembered all of the special memories I had from the ride. The first time I ever rode….the first time I dragged Seras on…late night at Halloween Horror Nights…the times when we had a skipper that felt the need to ham it up a bit or make it their own. So many fond memories…then it hit me. I looked around at all of the effects. Everything was dirty…it all looked so bad and it justhad a rehab a short time ago. Then, an epiphany finally hit me! I finally understood why this ride was going away. In the history of this ride, it does go down quite a bit. The cost of maintenance has to be astronomically high as compared to some of the other attractions. The fire effect has even been indecisive as to whether it would stay or go, because of the cost! Looking around…I just realized it was time. Now don’t take me the wrong way, I will miss the ride. It may have gotten stale for me, but I have fond memories attached. More I’m saying, it won’t be as bad as Back to the Future leaving. As we progressed through our final ride it ended in the same way it always did. The only difference is for the first and last time, Jazmin saw the shark. Poor thing got the poo scared out of her…literally! One last memory was made, and I’ll remember it forever (as I’m sure Jazmin will…I’m not looking forward to the therapy bill!) I must also mention that it was somehow the first time Todd had ridden as well. His opinion, it was cool. I just wish he could have seen it on a good day. At least he got the experience of seeing the one scared child that always managed to ride…to bad it was my kid…I feel so bad, but it’s something we will laugh about later…I hope! At any rate, we all had a nice time. It will be sad to see it go! But, at least we all got to say goodbye. Just one question remains….what will replace it? What is going to replace it? If you want to see more, check my source links below. One link in particular. I won’t say too much, but I will say HHNRumors found some pretty cool info on a ‘Project 722.” A lot of speculation as to what 722 means (Some say it’s a reference to page 722 of Deathly Hallows which references Kings Cross Station. Some say it’s in reference to Gringott’s because all of the vaults 700 and above were considered High Security…can it be both?) Check them out! More info is sure to come as the month progresses. Rumor is announcement will come January 24th. Uni has other projects in the works though, so that announcement may not be about Potter Phase II. Could be sooner…could be later…but I’m sure something will be this month since the popular belief is that construction will begin February 2012. At any rate, that’s all for now. Stay tuned to more madness to come. This entry was posted on January 1, 2012 by malicepsychotik. It was filed under Psychotik News Asylum!, Universal Orlando Resort News and was tagged with Amity, Harry Potter, JAWS, Jaws the Ride, Potter Phase 2, Universal Orlando, Universal Studios.